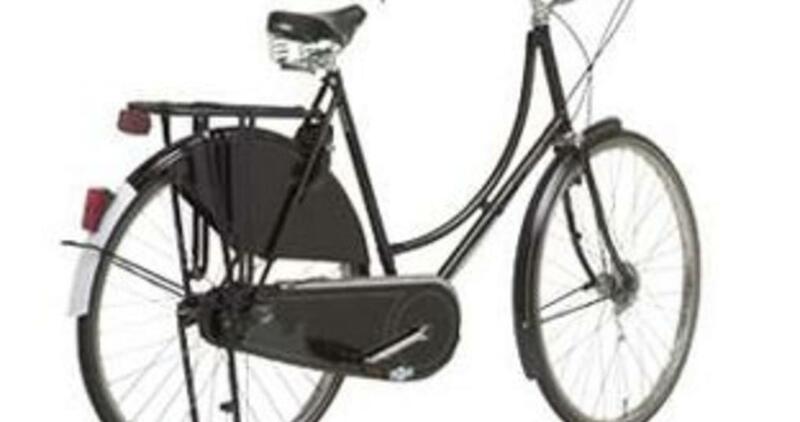 Demystifying the lifestyle of Dutch riding and Dutch style bikes. Probably Clever Cycles’ biggest head of steam at the outset is that we’re Portland’s first source of Dutch family transport and city bikes. Unlike the Xtracycle-standard longtails and folding bikes that fill out our line, and that I’ve used intensively for many years, I’m a fairly new user of Dutch bikes. I’ve admired Dutch bike culture strongly from a distance for a while, but am only now coming to learn what it means in my muscles, bones, and mind. 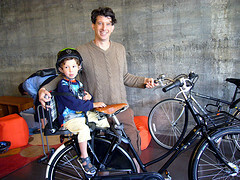 Jonathan at Bikeportland celebrated the introduction of the Electra Amsterdam to the US market as indicative of a larger trend. Many commenters there compared the technical specifications of these bikes unfavorably to commonly available commuter bikes, and concluded that there was nothing special here but looks. Leaving aside whether the Amsterdam may be considered illustrative of real Dutch bikes, I’m going to try to clear things up here. And I’m going to simplify and generalize a lot for the sake of brevity, so bear with me. You sit differently on a Dutch utility bike than on other kinds of bikes still in common use in America. How you sit has a big influence not only on your comfort and capacity to move, but on your mind. Just as laughing and smiling, even forcibly, can help lift a foul mood, sitting utterly upright, head high with your shoulders thrust back to “open your heart” exerts a powerful influence on your mind. It is serene, restorative, dignified. Mix well with endorphins and you’re getting there. I love watching people set off on Dutch bikes for the first time, seeing the initial wobbles of the unweighted handlebars relax a block later into a yogic smile and regal poise. And on those test-ride occasions I try to keep the tech talk short, because the ride is where it’s at, but do have a look at the stick riders below. Note in particular the angles of torso and leg (red) and the mean inclination of the legs (green) to the ground. The green angle correlates to the bike’s seat tube angle and the red loosely to the position of the handlebars in relation to the seat. The familiar racer’s posture has a sharp torso angle to let the buttocks–the biggest muscle group in the body–contribute optimally to turning the pedals, and a steep seat tube angle, ~73-75 degrees. These conspire to produce good aerodynamics and good power on a light, compact frame. Comfort isn’t a priority; it’s all about winning, the sheer thrill of speed, and the resilience of young bodies. The Tour/MTB/Hybrid (which I’ll just call mountain) posture may be understood simply as a more moderate application of similar principles, to support a higher degree of comfort into older ages and on longer rides while still accommodating out-of-the-saddle effort and reasonable aerodynamics. The seat tube angle is typically 72-73.5 degrees. This is by far the most popular “serious” bike fit in the US, and it is well-matched to the popular idea that bicycling is something you undertake for some hurts-so-good exercise and sporty fun, even if you’re just commuting or hauling some groceries home. It’s ubiquitous; people shopping for such bikes are often reduced to hours of online research trying to tease out how much better an LX derailleur is than an Acera, or similar differentiating trifles. Our folding bike selection supports this fit, but not our Dutch bikes. Until recently, those in North America seeking more comfort than the mountain posture supports have been offered mainly the “sit up and beg” option of the so-called comfort bikes (unless they were fortunate enough to have come across an old Raleigh, Schwinn or similar utility bike in serviceable condition, or resourceful/desperate enough to modify a bike extensively — you know who you are, you and your Technomics and Albatrosses and layback posts and 650Bs and all). Ergonomically, I think comfort bikes and their antecedants the cruisers, are sort of a disaster. They have the steep-ish seat tube angle of a mountain bike, and simply bring the bars much closer and higher. (The designers would appear still to buy into “the myth of KOPS.”) This results in a very shallow torso angle so the buttocks can’t help much with pedaling. You see riders of these bikes bobbing their torsos forward with each pedal stroke trying vainly to enlist more muscles to the aid of their smoking quadriceps. The saddles are appropriately broad to support the upright rotation of the pelvis, but all that broad tragic squishiness leads to chafing because the seat tube angle puts the pedals too nearly below the hips. A common compensation is to set the saddle too low, which only makes the other problems worse. 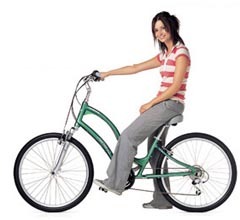 When Electra introduced their semi-recumbent “Townie” models they claimed “flat-foot technology” and “foot-forward design” as proprietary terms of art. They were quickly copied by most other major bike manufacturers. 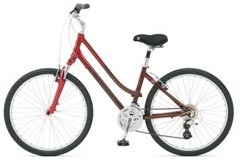 Unlike comfort bikes they support an upright posture while retaining a good torso angle, thanks to the slack 63-degree seat tube angle (it actually varies by seat height). These bikes are admirably bold and pretty smart, though arguably too much of a good thing, and inarguably a bit weird looking. The extreme slackness of the seat tube angle means that vigorous pedaling tends to launch the rider off the back of the saddle, hence the chopper/ape-hanger style bars to hang on to; some come with back-rests even to push into, like the true flipped-turtle-style recumbents you see sometimes down there in the biodiesel tailpipe miasma. To date, you can’t buy one styled and equipped to suit a wide range of grown-up needs. 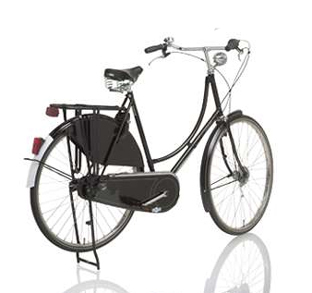 Which brings us back finally to Dutch bikes, which I’ll nominate the most grown-up of all bikes. Like the English bikes whose design they borrowed around the time the Wright brothers turned from bikes to powered gliders they have typically 65-67 degree seat tube angles. Uniquely among bikes discussed here, they impose no upper-body stress at all; you sit with your spine, neck and head as neutrally balanced as a column of acrobat’s balls, with your arms quite relaxed, elbows at your ribs. Yet your feet are far enough forward to enable reasonably efficient pedaling. Please don’t call it “sit up and beg”–that undignified moniker is a comfort/cruiser thing. There’s not much of an out-of-the-saddle story at all: there are no hills to speak of in the Netherlands. For that there are modern gearing systems, at least on the Dutch bikes Clever Cycles carries. Shimano’s latest technology makes flat Holland’s most mature and beloved bicycle designs work almost anywhere. Dutch bikes are not about any sort of Euro-fetishism, nor do any of us have Dutch ancestry. It’s about the ride. Dutch position isn’t even exclusively Dutch. Older English, Danish, Chinese and Indian utility bikes: same deal — this is simply the most popular way to sit on a bike, ever, in terms of numbers, but it’s barely known in America. The Chinese call the posture “holding the bedpan,” and the free upper body poise there implied works for sipping coffee and hunting open wi-fi spots, too. Come to the shop and try one, or five. We have fully lugged steel city bikes with 8-speed internal gearhubs, full chaincases, full-coverage fenders with giant mudflap, skirt/coat/boa guards, integrated wheel locks, front and rear hub dynamo lighting, sprung Brooks saddles, 47mm wide Schwalbe Marathon tires on 700c alloy rims, drum brakes, steering stabilizers, center stands, klingly bells, ultra-heavy-duty rear racks with frame-fixed front rack option. My god they weigh a smooth silent ton — potholes will fear your imperturbable momentum. Good for decades of stylish urban family mobility with minimal maintenance, all seasons and times. O and baskets, transverse panniers, front and rear kid seats — the whole deal.